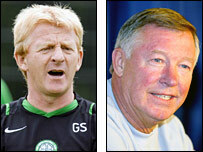 Celtic manager Gordon Strachan says he would love to resolve his differences with former mentor Sir Alex Ferguson. Ferguson was Strachan's manager at Aberdeen and then Manchester United, but he was critical of Strachan in his autobiography a few years ago. In Strachan's own autobiography, being serialised in the Sunday Times, he says he would like to smooth things over. "One day it would be great to sit down with him and have a proper chat about our clashes," he said. "(It would be great) to bring our relationship closer to what it was like in its most harmonious periods. "It is sad that our relationship has come to this." Strachan says he was treated like a child by Ferguson for much of their time together. "As much as I admire Fergie for what he has achieved, I have to admit this is offset by the memories of the deterioration in our relationship," added Strachan. "As indicated by his comments about our time together in his autobiography, it would seem that Fergie is not too enamoured with me either. "Those comments, which related mainly to my desire to leave Aberdeen and Manchester United, and included Fergie stating that I "could not be trusted an inch", surprised and disappointed me. "I know I made one or two mistakes in my dealings with him, but I feel there were mitigating circumstances. "One of the problems in my relationship with him was that the longer we worked together, the more I needed him to adopt a different attitude and approach with me. "I needed him to treat me as an adult, not a kid; to have some respect for the fact that I was an experienced professional to whom abuse from the manager had become more of a motivational turn-off than a stimulus. "Not long after he joined me at Manchester United and took up from where he had left off with me at Aberdeen, I remember telling him 'Listen, you spoke to me like that nine years ago. It might have worked well then, but it is not going to work now'. "But the screaming and shouting did not cease - it just got worse and more personal." Strachan decided to leave Aberdeen when his contract expired in 1984. "In November 1986 he joined me at Old Trafford. It was a great move for him and Manchester United, but not, as it turned out, a great move for me. "I had loved playing for Ron Atkinson at United. After being beaten with a big stick for so long at Aberdeen, it was refreshing to have a manager who trusted and appreciated me, and treated me as an adult. "When Fergie moved to United, I had to endure the big stick again."